Major Pat "Rock" Hudson is a U-2 pilot at Beale Air Force Base. He was a very busy guy because he was in charge of the whole air show. I was really fortunate that he made the time for me to ask him some questions. Here's our interview - I hope you like it! Lockheed U-2 "Dragon Lady"
Maj. Hudson, how did you get into flying? Well back in high school I was interested in flying helicopters for the Army. I had a ROTC instructor who was in helicopter pilot in the Army and I wanted to follow in his footsteps. Ironically I joined Army ROTC at Alcorn State University and subsequently was accepted to the Air Force Academy which I ended up attending and graduating from. So once my mentor/instructor found out I had been accepted to the Air Force Academy, he encouraged me to pursue a career in the Air Force. I did not get a pilot slot immediately following graduation from the Academy but I applied several times and was finally accepted after six years of active duty to go to pilot training. So that's how things worked out for me. So did you get your pilots license in the military? I earned my single engine private pilots license while I was in the military but while flying extracurricular, versus flying for the military. So you were flying single-engine planes like on the weekends and that's how you got it? So when did you join the military? I was commissioned June 2 of 1993, so I've been in almost 16 years. So how did you get to a point where you could become a Major? I was always told, and I still hear this advice being given, just try to do the best job that you can and concentrate, you know, on doing your job, doing it well, going above and beyond, and things will take care of themselves. There are some things that you can do to help yourself out in that regard, such as earning a masters degree and trying to volunteer to do things outside of your job. Those things are recognized by the people in charge of you and that shows that you're going above and beyond the norm. So have you had any close calls? 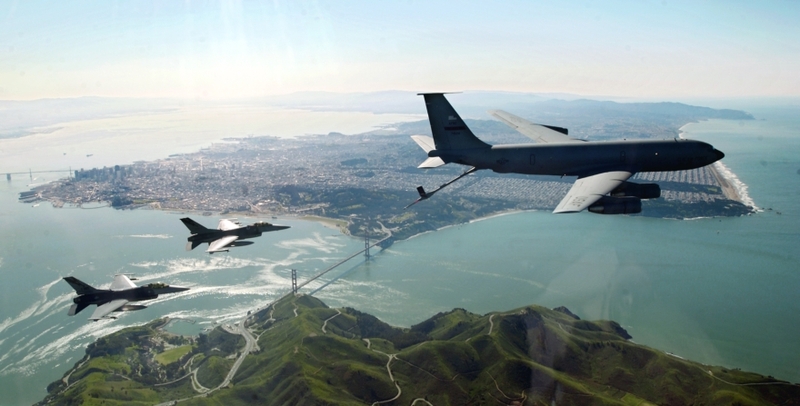 I used to fly KC-135 refueling planes, and I'll say probably the most worried that I've been in an airplane was when we were doing refueled in over the Indian Ocean. We'd drive north from this island out in the Indian Ocean for couple of hours, refueled another airplane, and then go back. My crew and I gave away too much gas and we were kinda worried about getting back home! We did everything we could to conserve as much gas as we could so we could get back home! So please share some cool flying stories. Taking off in pitch black darkness, in the middle of the night, over the desert, fly over Iraq and other countries and you know it's just you up there alone, pushing 70,000 feet. It's very peaceful and and cool. Very rewarding. You can look out and see satellites sometimes, you can see the moon which is much more clear because you're up above all the atmosphere in the disturbances, and it's just very peaceful and very cool. I have flown combat missions in the KC 135 and in the U-2. I have not been engaged directly in combat, but I have flown missions supporting troops on the ground who are engaged in combat. We've got an airplane that's airborne right now as we speak. Special thinks to my friend Major Pat "Rock" Hudson of Beale AFB for taking the time to let me interview him during the super 2009 Beale AFB Air Show and Open House.